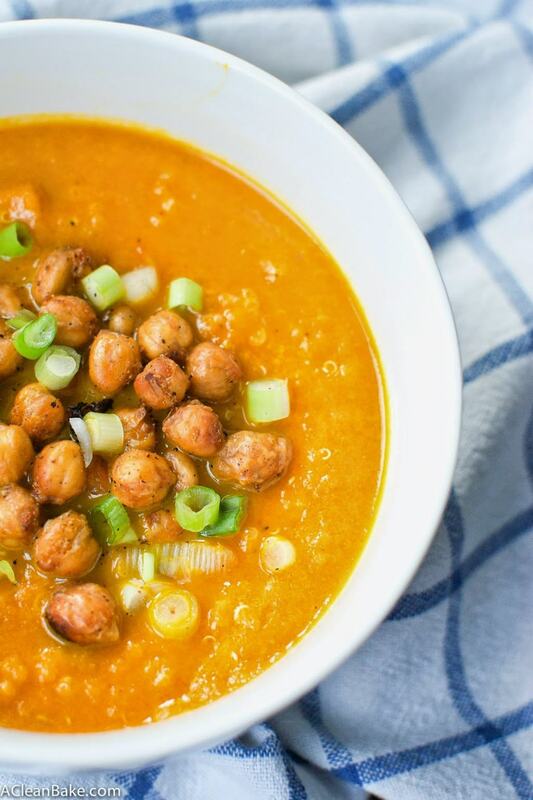 This vegan and gluten free carrot soup is perfect all year round! It’s delicious served cold in the summer or warm in the winter. 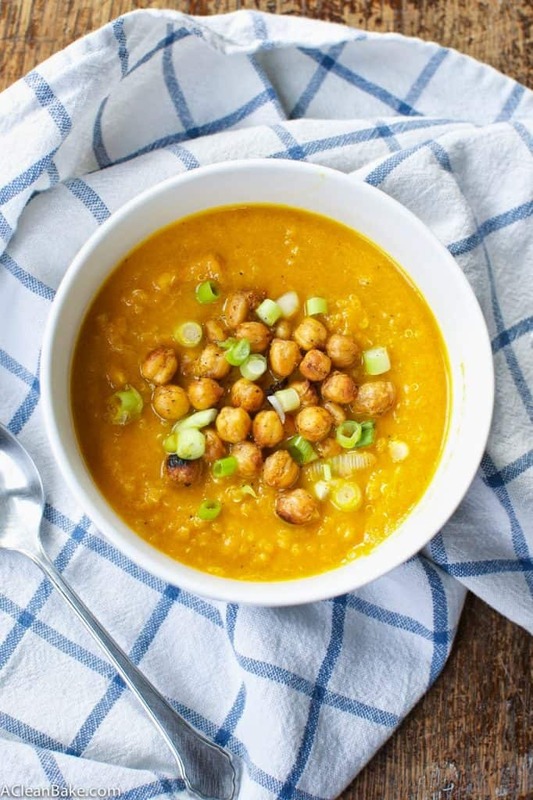 Hearty from quinoa and topped with chickpea croutons, this healthy soup is a great meal! Soup in June? Don’t worry; I haven’t lost my mind…at least not any more than usual. There is just something about the transition from spring to summer always makes my taste buds crave fresher and less-sweet fare like this chilled carrot soup. Not to mention that ever since I got home from vacation, it has been cool, grey and dreary! This soup may sound a little odd, but it is rich and creamy, filling and comforting, and slightly sweet from caramelized sugars in the roasted carrots. Plus, it is easy to make, can be eaten hot or cold, and the recipe can easily be multiplied to feed a crowd. Think of it like carrot gazpacho. Freeze leftovers and, along with a good veggie burger, you’re all set for your next BBQ! PS: Let’s do a quick poll! I’d like to do more of these savory recipes once in awhile. Tell me how you feel about that by leaving a comment below. Do you want to see some more savory food here, or do you come here exclusively for sweets? Make the soup: Preheat the oven to 350F. Line a baking pan or cookie sheet with a nonstick pad, parchment paper or a generous coating of nonstick spray. In a large bowl, toss the carrots and onion with a splash of olive oil (about 1-2 Tablespoons) plus a pinch each of salt and pepper. Spread in a single later on the prepared pan, making sure there is space around each piece. Bake for 45 minutes to an hour until vegetables are tender and slightly caramelized. Preheat a small stock pot and more oil (about 2 Tablespoons) and fry the curry powder, garlic powder, and ginger for about a minute, stirring constantly, until fragrant. Do not let the spices burn. Add the roasted veggies to the pot plus 6 cups of stock. Bring the soup to a boil, then reduce to a simmer and cook until the carrots are very soft. Turn off the heat and let the soup cool, then puree it in a blender, adding more stock or water as necessary to ensure the soup liquefies. Don't add too much; just enough to keep things moving in the blender. Make the chickpeas by tossing all ingredients in a large bowl and spreading on the prepared baking sheet with plenty of room around each. Roast at 400F for 25-30 minutes until crispy and golden. Allow to cool on the pan before serving; they will crisp up as they cool. Immediately before serving, assemble the soup: Put about a half cup of cooked quinoa (or as much or little as you like) in the bottom of a bowl, and top with soup. Garnish with a handful of crispy chickpeas and a pinch of chopped green onion. I used homemade chicken stock, which lent a stronger, more pungent chicken undertone to the soup than if you use store-bought. 1 Tablespoon of curry produced a perfectly balanced flavor for me. However, if you are using store-bought chicken stock, or simply have a more sensitive palate, this might be too much for you. 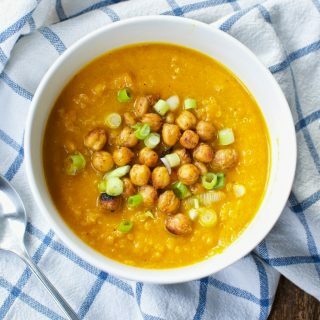 If you are concerned, start with 1/2 Tablespoon (or even less if you want) and wait to add the rest until after the soup is fully pureed and you can taste all of the flavors together. Use vegetable stock for vegan or vegetarian version. Yield: Makes about 6 bowls of soup, depending on the size of your bowl. Looking for a warmer soup? I have plenty in my soup archives, including a reader favorite homemade tomato soup! This looks awesome and my vote is YES for savory recipes! 🙂 Hope you and the little one are doing well!